Late next year, if all goes to plan, SpaceX and Boeing will begin sending American astronauts up to the International Space Station, ending Russia’s monopoly on the ticket to orbit. In anticipation of the new space taxis, NASA is now building its commercial partners a parking spot. 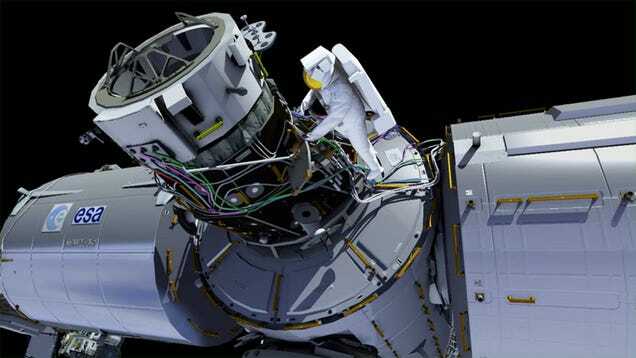 On Friday, astronauts Kate Rubins and and Jeff Williams will perform a six-and-a-half hour spacewalk to install the first of two International Docking Adapters, which future CST-100 Starliners (Boeing) and Crew Dragon capsules (SpaceX) will use to link up with the ISS. Rubins and Williams will be getting some assistance from the Canadarm2 robotic arm, which’ll extract a docking adapter from the latest SpaceX Dragon resupply capsule later today, before maneuvering to the spot where the astronauts will be working on Friday. Formed in 2012, NASA’s Commercial Crew Program is part of the agency’s long-term strategy to bring back American autonomy in space. The two biggest benefactors, SpaceX and Boeing, have each received upwards of $3 billion from NASA to develop systems for ferrying astronauts to low Earth orbit and the ISS. (Currently, the only way for Americans to get into space is to hitch a ride with the Russians, out of the Baikonur Cosmodrome in Kazakstan.) Both companies have been hard at work, and are on schedule to start sending crews up in 2017. Friday’s spacewalk is scheduled to begin at 8:05 am EDT, and you can watch the entire thing live over on NASA TV.